Opening with a potato is a bold move in any circle, and I am not convinced that it pays off in Richard Moorhead’s pamphlet. Moorhead’s collection of fruit and vegetable poems is more a set of images – some clever, some arresting, some beautiful, some contrived – than a cohesive whole. He has a lovely way with words, sometimes. He occasionally lifts the vegetables onto a higher plane, and invests each with more significance and beauty than it would otherwise have – and there is a joy to that, a sense of revelling in the sheer mundanity of his subjects (broad bean, cabbage, peach) and a pleasure in elevating them. However, despite some gorgeous one-liners and a scattering of beautiful images, I can’t help feeling that this collection is trying too hard to be weighty. For all the hard work that Moorhead demands of his language, I can’t forget that he’s writing about, well, vegetables. I start wondering what, exactly, is the point. I’m also not sure what Moorhead’s beef is with capital letters. If having all lower case serves the poem, then go for it, but here it feels tacked-on – too much like the shopping list that his contents page resembles and not enough like the dictionary definitions the poems strive for. Moorhead’s style deliberately breaks up each image in the poem, which is part of what keeps this collection from feeling like a designed whole rather than a chance collection. I dislike the dictionary-style numbering of each point – it reduces the poem to a list and prevents the images from speaking to each other and building on each other. Changing this would, perhaps, allow each poem to become more than the sum of its parts. The differentiation is somewhat alienating to read, and leads to a disjunct between the lightness with which he treats each image and the weightier significance he appears to be lending each poem. Even with some of the well-constructed images, I get the impression that Moorhead has written them because he likes the way they sound, rather than because he believes in what he is saying. I don’t have a problem with manipulating and playing with sound and language just for the hell of it, but one needs a more dextrous grasp of words than Moorhead has to be successful. He returns often to bodily images – thumbs and eyes – but it’s clumsy, to the point where I wonder whether it illustrates a lack of imagination rather than thematic stitching. Overall, then, this is an interesting concept, and a bold idea, but I’m not entirely convinced that vegetables are the right subject for an entire collection of poetry. Splitting the poems by season is a cute idea, but doesn’t really become enough to hold the collection together. 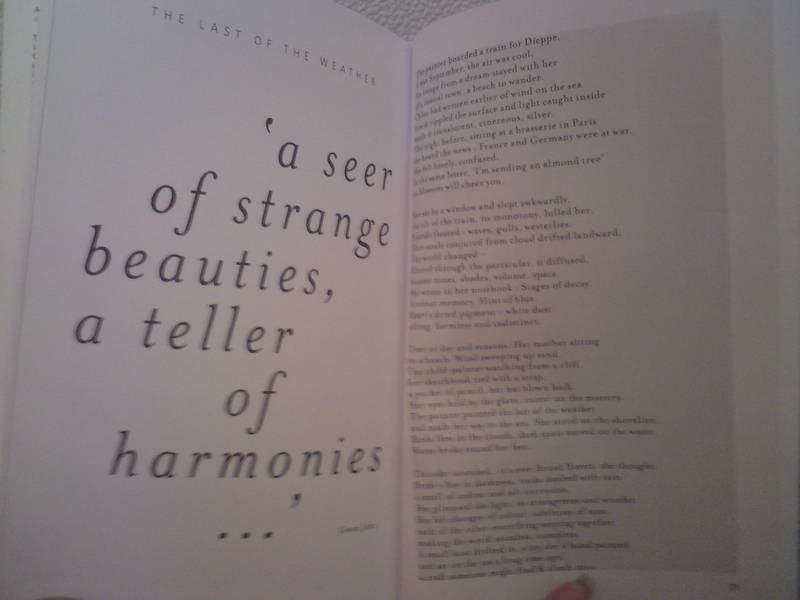 Despite the obvious links between the poems this pamphlet doesn’t really hang together as a complete set of ideas. I get the impression that Moorhead intends it to, but the pamphlet seems to lack the courage to really invest in the poems. Moorhead can’t decide if he wants to indulge his slightly lurid descriptive tendencies (which are mostly successful) or his sexually charged metaphors (which are less so). So, he tries to do both, and more, and the poems just can’t bear the weight of what he is asking them to do. Jo Slade’s pamphlet The Artist’s Room is as unique in presentation with its hand-stamped Munster motif as James Brooke’s beautiful pamphlet The English Sweats. The two have been published by Pighog and if they are representative of their larger output then this small press is impressive for its dedication to creating aesthetically beautiful and tailor-made pamphlets. Front cover - slightly dirty from a trip in my handbag. There is nothing meretricious about this collection, much like the hushed colours of its cover, the poems whisper to you. They will not sleep with you on the first date but they will get you drunk and talk of their last desperate relationship. Jo Slade’s obvious passion for Gwen John, her work and her life, carries the pamphlet through. Not quite a work of art, not quite a biography, it’s a reminder of the unexpected otherness of poetry – its ability to metamorphosis facts without betraying them and its capacity to take the reader by the hand and through the looking glass. 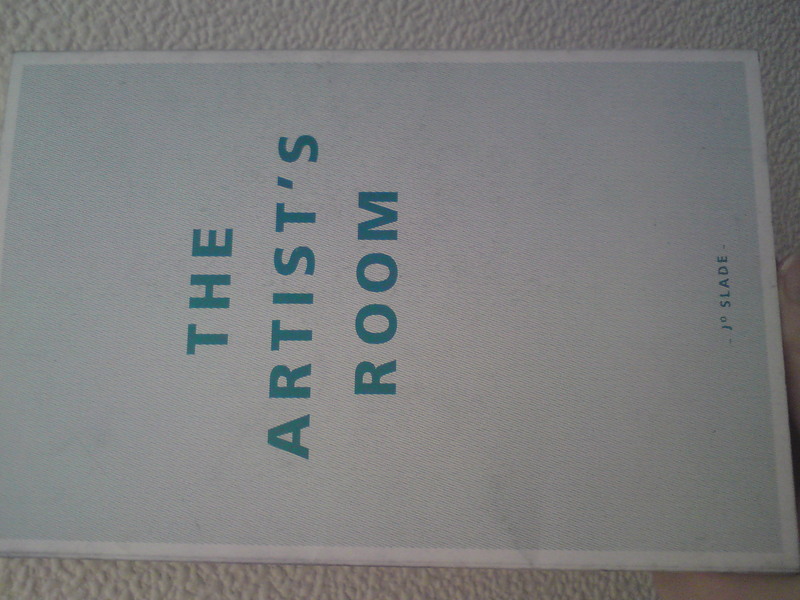 The Artist’s Room is on sale now for £6. There are 300 hand-stamped versions available so hurry if you want a limited edition! Tori Truslow’s ‘Markets like Wide Open Mouths’ is not yet an anthology of writing and photography from Bangkok that you can purchase or procure (unless you ask her very nicely). I say ‘yet’ because I don’t doubt that it will get snapped up in the near future by a discerning publisher. In the meantime it is a thirty page photocopied and stapled black and white booklet with a scrap book aesthetic. This relationship between the present and the (sometimes legendary) past in Bangkok is, I feel, the core of the anthology and one which Truslow strives to present to the reader in all its complexity. At times though, she is in danger of leaving the reader at shore so familiar is she with her material. This is a problem that could be easily resolved by a few more introductory sentences to tame the pile-up of unfamiliar descriptions. Mixed in with these set pieces, Truslow also includes day/night fragments, impressions of the city as the sun rises or sets. These are my favourite sections for letting me ‘live’ the city. Truslow has a magic turn of phrase, she writes in Morning #1 for instance: ‘yesterday’s overheated engines are cold, sleeping or just warmed up’. She acts as a people magpie picking out the idiosyncrasies of individuals to capture a place: ‘Thai men drinking icy water, one flipping through a magazine of muscle-rippling guys in tight underpants’. Truslow’s Bangkok comes across in this work as a culturally rich, touristy, buzzing, cosmopolitan, ghost-infested and endlessly fascinating city. In her hands, even a bus journey becomes extraordinary. It is difficult to review a work that is still rather exclusive, but if the above words attract you in any way let me point you to the next best thing: Truslow’s flâneur blog of Bangkok from which much of the writing in the booklet comes from. One continuous scroll-down carries you through an entire issue. Fouquet’s black and white photos and whimsical drawings by Joe Rosenblatt, aka Muttsy, alternate with each other, slipping between the written pieces like light passing through spokes. It’s a layout that works well for the stand-alone literary selections, and even for Muttsy’s diverting art, but frustrates when viewing Fouquet’s photo essay. Indeed, it interrupts the flow of her sequence: each image of a bike at rest builds on the one before, beginning with the front-page photo of handlebars wrapped in Spanish moss. Yet the photographs are featured intermittently throughout the issue. Fouquet’s images include pictures of bike frames and wide wire-mesh baskets draped in Mardi Gras beads; close-ups of a pitted bell and a duct-taped saddle; bikes leaning on lampposts and tucked against metal rails; bicycles folded, white-walled, shiny and worn. Fouquet’s photos are subtly evocative in their observance of an urban agility newly revived and genteelly rendered in black and white. ‘Still Life with Bicycles’ should have been shown all of a piece to retain that tender mood. What interrupts the path of Fouquet’s bikes isn’t always worth stopping for. But for every drive-through dash of writing, there’s an arresting idea, a phrase, a rhythm, a rhyme to hold your attention. Elsewhere, J de Salvo considers ‘the whole animate world somehow rotting in a sink,’. Stalled between decay and rebirth, he plumbs the depths of stagnation with a rummaging and ruminating both earthy and sublime. of skateboards across sidewalk cracks. . .
like the loamy tongue of a cartoon man. . .
Sue Kreke Rumbaugh creates a narrative (one of just a few found in the issue) for the Vermeer painting, ‘The Music Lesson’. It holds the nub of a good short story about marital disappointments and secrets, but suffers from a classic case of too much telling, not enough showing. Alison Wilkins’ poem ‘The Girl Who Sits On Her Feet’ suffers from no such fate. It grabs you from the get-go with its telling details and knowing ways, barreling through a ground-down life faster than a slot machine will swallow your money. But the most enchanting element of this issue is the eccentric world doodled by J. ‘Muttsy Rosenblatt,’ who claims the personalities in his drawings grow exactly like limbs. Muttsy must be one unusually funny guy, to judge by the charmingly kooky critters cavorting across his canvases. They’re a frisson of delight shooting all the way through the Bicycle Review. While the journal’s spare format is designed to showcase its contributors, a judicious realignment would make the whole greater than the sum of its parts. And the Bicycle Review has some very good parts. New Fairy Tales‘ mission statement is there in its title, and stated again on its website: ‘to promote the writing of a generation of new fairy tales’. Fairy tales, those deceptively straightforward, ever-evolving, world-shaping things, are vital to a healthy literary culture and to the human imagination, and writers of all backgrounds and genres seem to enjoy playing with the old ones – but the creation of new ones is an important endeavor too. I’ll be honest, I have a fondness for New Fairy Tales that stems partly from the fact that my first short story publication was with them (‘The Siren’s Child’, in issue 2, if you were wondering), but I do believe the magazine fills an important niche. It also encourages readers to support a children’s hospice, providing a donation link, and is online, easy to navigate, and aimed at as wide an audience as possible – because the important thing about fairy tales is that they get read, or heard, or seen. Which isn’t to say the editors aim to please everyone with fluffy, U-rated content. They acknowledge that children can be attracted by the dark and the twisty, and not all these tales end joyfully. I think narrative and symbols are mind-food for all ages, as beauty is soul-food – and this is certainly the most beautiful issue to date. Two pieces of Faye Durston’s art early on set the tone, enigmatic stories in themselves; how lovely to spend a stolen work-break clicking through something as full of the promise of escape and wonderment as a thick hardbacked tome you’d read as a tucked-up child. The issue reaches pure daydreamy gorgeousness with Adam Oehlers’s graphic story ‘Dear Little Emmy’. This is really a very short and simple ghost tale, but told with such witchy tree-knotty stream-drowny images, the wordlessness making it all the more whimsical and cruel, that it lingers for a long time after. In fact, Oehlers is a favourite new discovery of mine, thanks to this issue. The prose stories in the issue all take very different approaches to the idea of a new fairy tale. Opening the magazine is ‘Ragabone’ by John Patrick Pazdziora, the tale of an old man who doesn’t speak, the children who taunt him, and a clockwork bird, that feels at once faraway and close to home. The prose is straightforward and always stays good-humoured, but there are little language-choices that subtly evoke what it is to be ‘othered’, like the way the children choose a name for the central figure and then use it to justify their jeers, explaining to each other that he’ll eat people for their tongues “because he’s a Ragabone”. This is one of the best approaches to a literary fairy tale for today – containing morals, but not moralistic. ‘her breath caught in her fragile throat when she saw the extent of what she had made, and she stood for a moment more, thinking she was indeed beautiful’. There’s also a dark fantasy in Emma Matthews’s ‘The Lady Wore a Shawl’, fun meta-narrative in Natalie Brown’s ‘So it is Written’, and a melding of horror and fairy-tale in Mark Tomlinson’s ‘Der Kinderaube’, keeping the contents stylistically and thematically diverse. – and then showing ‘fairy-tale’ and ‘real-life’ narratives to be far more co-tangled than the proponents of growing up would have us believe. But as a poem this didn’t feel quite done, as if the language could have used another layer of crafting to make it really stick. I had the opposite problem with Kelly Swain’s ‘An Ambivalence of Ladybirds’, brimming with startling imagery, and Ryan Ormonde’s ‘Wondertale’, rhythmic and strange – neither had a tangible impact (on me, at least), despite the interesting language-play.